Arcanum-Butler Schools Band Director Heather Marsh is a quarterfinalist for the Grammy Foundation’s 2019 Music Educator Award. ARCANUM — Arcanum-Butler Schools Band Director Heather Marsh has been recognized by the Recording Academy, a society of music professionals that, among other programs, presents the prestigious Grammy Awards each year. Marsh was one of 188 quarterfinalists announced for the 2019 Music Educator Award. More than 2,800 nominations were submitted. The Music Educator Award was established “to recognize teachers who have made a significant and lasting contribution to the field of music education, and who demonstrate a commitment to the broader cause of maintaining music education in the schools,” according to a press release issued by the school district. The Recording Academy will select 10 finalists and, ultimately, one winner to receive the award; the winner will be flown to Los Angeles to attend the 61st Annual Grammy Awards ceremony in early 2019. The winner also will receive a $10,000 personal honorarium. 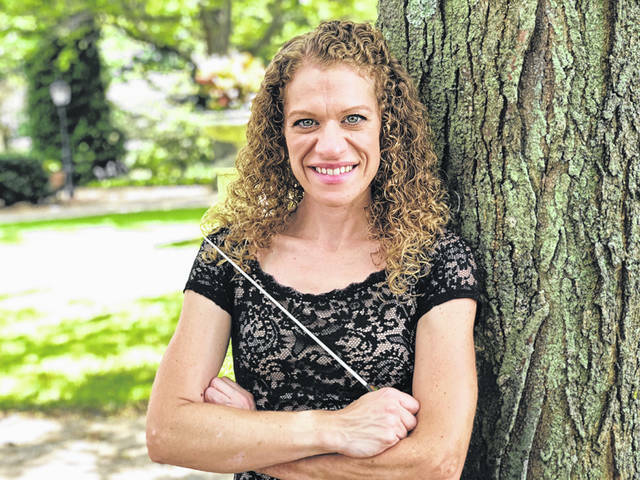 Marsh is beginning her third year as band director at Arcanum, having served as assistant band director at Tippecanoe Schools in Miami County for nine years. Since that time, the Arcanum band program has added a color guard, qualified for a superior rating during state finals for the first time in more than a decade and increased the complexity of the type of shows it performs. It takes more to maintain a competitive edge these days, according to Marsh, than it might have done when many of her students’ parents were growing up. To meet those expectations, Marsh and her students organize each year’s performance around a central theme, an idea chosen by her students that is then explored and expanded upon throughout the year. The title of this past year’s show was “Under Construction,” so students integrated orange construction cones, buckets, barrels, trash cans and sawhorses into their performance alongside regular instruments. The theme of this year’s show will be the words we use and how they affect other people. This entry was tagged Arcanum, Band. Bookmark the permalink.